Is government oversight strong enough? A scandal over mold-contaminated medicine that killed dozens of patients last year has added fuel to a debate over how well federal and state officials are policing the safety and effectiveness of prescription drugs. Innovative medicines have helped drive down death rates from such diseases as HIV/AIDS and cancer, but other drugs have spurred concerns about safety, physician prescribing practices and patient abuse. 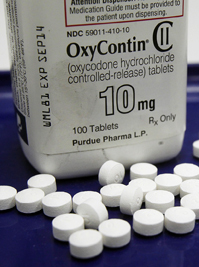 Painkillers known as opioids are blamed for a nationwide wave of addiction, for example, and the growing overuse of antibiotics has led to a surge in deadly, drug-resistant infections. Meanwhile, beginning next year, the pharmaceutical industry, which spends nearly $29 billion annually on product promotion, must disclose an unprecedented level of information about its efforts to market drugs to consumers and doctors.